by Moss Hart Author · Christopher Hart Author of introduction, etc. With this new edition, the classic best-selling autobiography by the late playwright Moss Hart returns to print in the thirtieth anniversary of its original publication. Issued in tandem with Kitty, the revealing autobiography of his wife, Kitty Carlisle Hart, Act One, is a landmark memoir that incluenced a generation of theatergoers, dramatists, and general book readers everywhere. 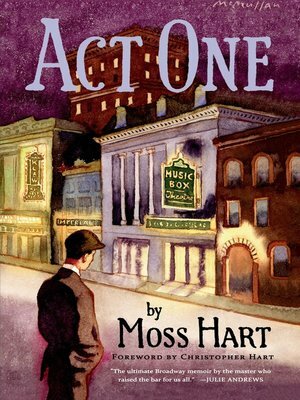 The book eloquently chronicles Moss Hart's impoverished childhood in the Bronx and Brooklyn and his long, determined struggle to his first theatreical Broadway success, Once in a Lifetime. One of the most celebrated American theater books of the twentieth centure and a glorious memorial to a bygone age, Act One if filled with all the wonder, drama, and heartbreak that surrounded Broadway in the 1920s and the years before World War II.